Perhaps you remember that we tried to go to our local fair last month and it was a bust. They didn't have the agricultural stuff. And we were so bummed. So we decided to journey into another country West Virginia for their state fair. The traffic to get there almost killed us, but we finally made it. We took so many pictures that I think I'll break it up into a couple of blog posts. 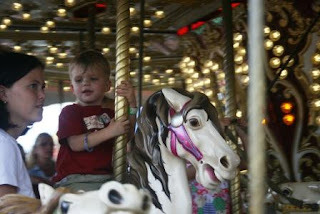 Pierce and I rode the ferris wheel and the carousel (as well as bumper cars, a helicopter ride, and a train). One thing I liked about our local fair was that they had antibacterial gel stations all over the place. There wasn't any to be found at the WV State Fair, and the grundge of the rides did kind of gross me out (but not as much as Paul's lunch - more on that later). One nice thing about the WV state fair is that they have tons and tons of construction equipment. And the kids can climb on it. 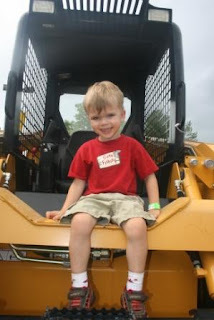 Pierce is really into things like backhoes right now. And bobcats. But by far, the best thing in my 3 year old's eyes was the Zhu Zhu land. Pierce has two Zhu Zhus. Nugget and Scoodles. He saved up for Scoodles with his allowance he gets for doing chores. So he was thrilled to see Zhu Zhu land. Embarassingly, I don't even know where Zhu Zhus originate from. Are they a tv show? A video game? Clueless without a tv here...help me out! 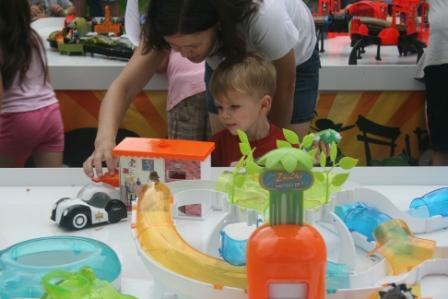 There were two big Zhu Zhu tables set up for play. One was a Kung Zhu table and the other was just normal Zhu Zhus. 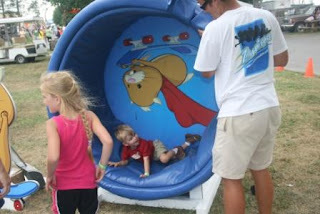 They also had a Zhu Zhu maze and this kid-sized hamster wheel. Pierce didn't fare so well in the wheel. I think he gets his lack of coordination from me. Ok now you have me curious. If you hopped into West Virginia that only leaves a couple of places you could live. I live in Ky and I know OUR state fair would have had the huge agricultural stuff lol. I mean hello that IS the state fair.. I can't imagine one not having all of that. Zhu Zhu's are basically electronic pets. 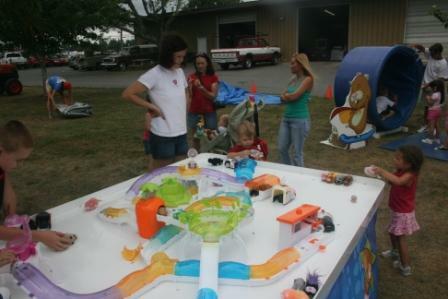 They give kids the feeling of owning a hamster with the smell or mess. Looks like everyone had such a great time! Seriously...I have NO CLUE where those dang zhu zhu's originated from! 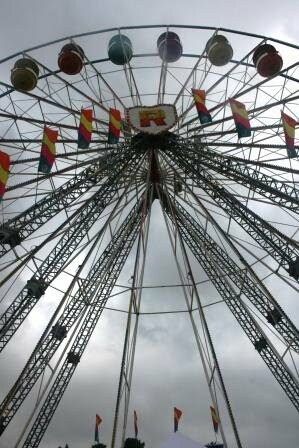 Out state fair comes this fall and I always look forward to it, now more since seeing your great time. The zhu zhu pet place is too much! Maddie would have loved that Zhu Zhu land!! She is obsessed with them!!! Hey now, WV is excellent! Now about East Virginia, that's a whole different world there! Glad you had fun! It's hard to beat the fair! Here from Mom Loop :) Thanks for stopping by my blog, too! Anyways, looks like you all had a great time! We're trying to patiently wait for our state fair...cheese curds...YUM! AHHHHHHHHHHHHHHHHHHHH!!!!!!!!!!!!!! ZhuZhu Pets! Soooooooooooooooooo Cute!